Biography of Alfred B. Nobel (1833- 1896) - Robolab Technologies Pvt. 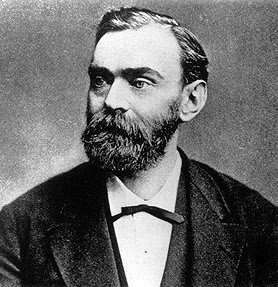 Ltd.
Alfred Bernhard Nobel was born on October 21, 1833 in Stockholm, Sweden. He was the third son of Immanuel Nobel and Andriette Ahlsell Nobel. In his early years of study, Alfred took interest in chemistry. But later in Paris he met Ascanio Sobrero who had developed a highly explosive liquid called nitroglycerin. In 1859 Alfred and his brother Email created a factory in order to gain more information about nitroglycerin through experiments. Their various experiments led to many explosions throughout the years; one immense explosion killed his brother Email and several other people. Nobel realized the he had to develop a way to safely transport nitroglycerin. He tried to mix the nitroglycerin with silica and he formed dough- like paste that could be molded into any shape, he called this compound dynamite. Soon after he developed a blasting cap which would safely detonate the dynamite. Dynamite revolutionized the construction industry by making rock blasting and drilling tunnels safer and more cost effective. This allowed for great progress in railroad construction through mountainous terrain. Dynamite was used to make the ammunition for cannons and riffles far more powerful, therefore making it more dangerous and deadly. Dynamite was also used in the construction of new cities by blasting through the tiniest of hills and the largest of mountains. Railroad development boomed and new cities appeared out of dust. The development of the new safe explosive was now being used as a weapon during World War I. Nobel, even though he was peaceful and against war, continued developing more dynamite and other powerful explosives with the hope that he would eventually develop a weapon so destructive that warfare would become impossible without massive repercussions. Before his death in December of 1896 he created the various Nobel prizes that are still awarded today. The Prizes included Physics, Chemistry, Medicine, Literature, and Peace. Nobel did not want to be known as a man who had developed the most destructive weapon that the world had ever seen but rather as a man who loved literature and poetry and the creation of these prizes was ultimately his life’s dream. After his achievement that made him famous he continued to develop more inventions and overall had 355 patents. Some of the most significant being synthetic rubber and leather and artificial silk. He continued to open factories and laboratories, creating about 90 factories and lags in over 20 countries. At the age of 63, he died on 10 December 1896 at Sanremo, Itlay.